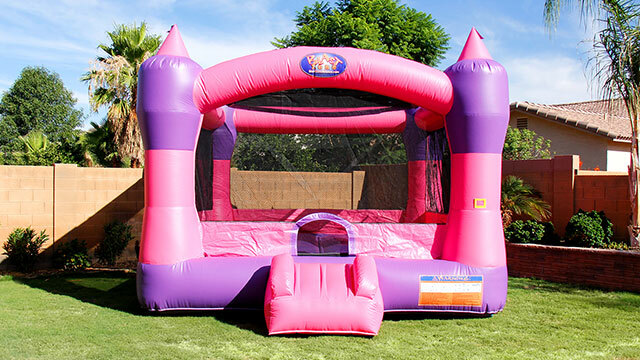 Every little Prince loves jumping around in their own bouncy castle. 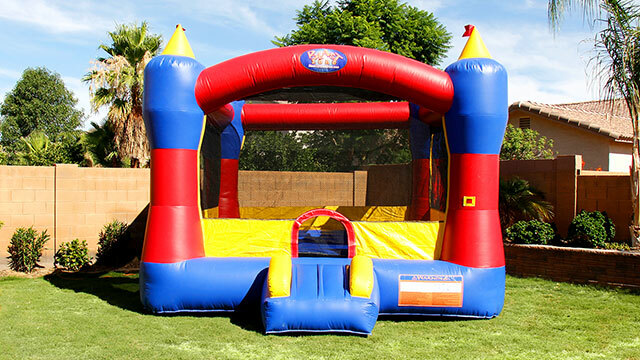 Our Magic Castle Bouncer will provide him and all his friends with lots of room for jumping at an unbeatable value! 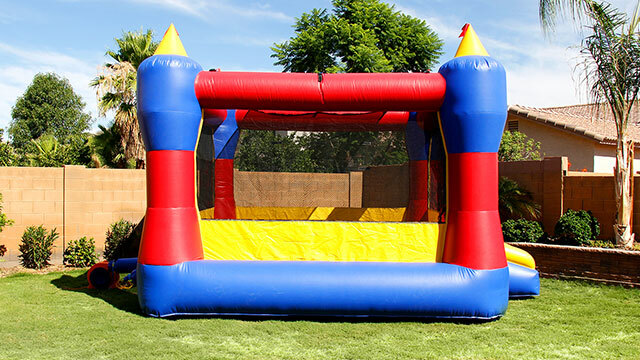 A small ramp provides safe, easy access to the bouncing area, and the surrounding netting and snap-shut door will keep kids safe while they bounce and have a blast! It also includes a mesh roof to help players escape the Arizona sun and keep cool for hours of jumping fun. 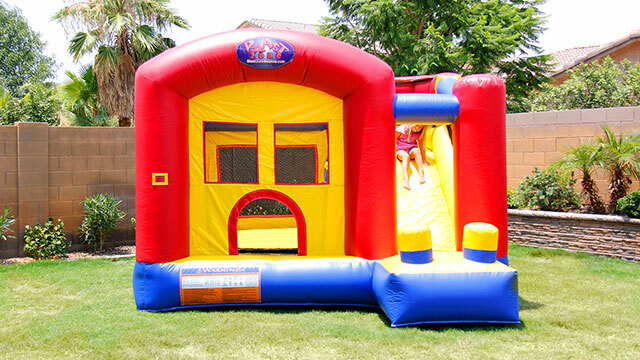 This inflatable is great for both private rentals and commercial rentals for recreation centers, churches, or schools. 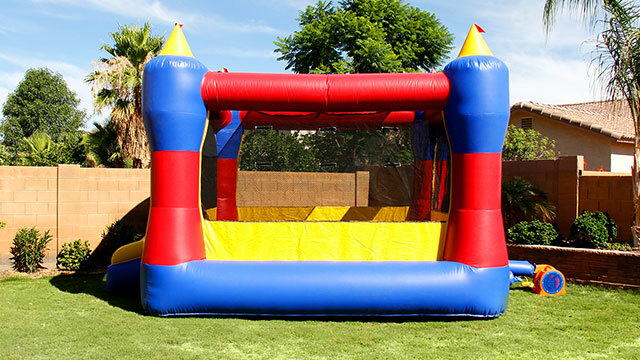 During the hot summer months the Magic Castle Bouncer can be rented with a misting roof to lower temperature inside by up to 30 degrees. The girl in the photos is our daughter, pictured for scale. She was 5 years old and 45" tall at the time of the photos. Now, here is an inflatable fit for your Princess! 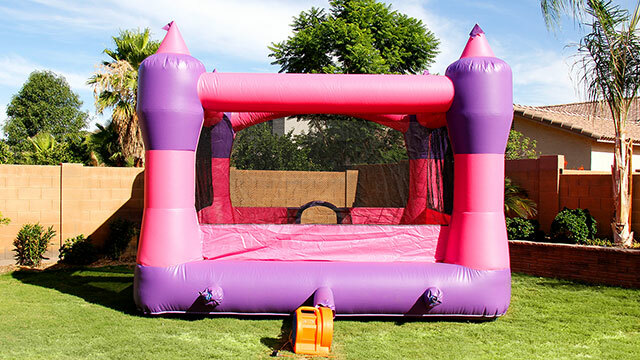 Our Princess Castle Bouncer proudly displays vibrant pinks and purples to blend in with most any little girl’s party décor. 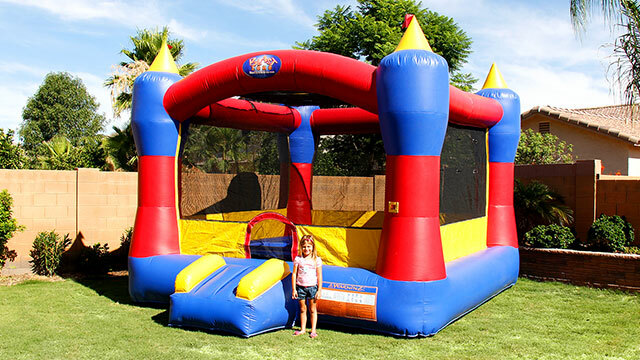 A small ramp provides safe, easy access to the bouncing area, and the surrounding netting and snap-shut door will keep kids safe while they bounce and have a blast! 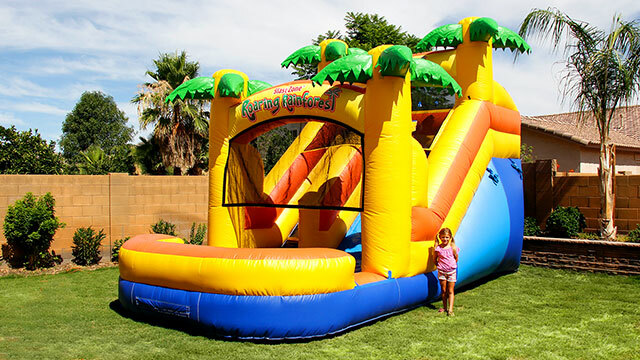 It also includes a mesh roof to help players escape the Arizona sun and keep cool for hours of jumping fun. This inflatable is great for both private rentals and commercial rentals for recreation centers, churches, or schools. 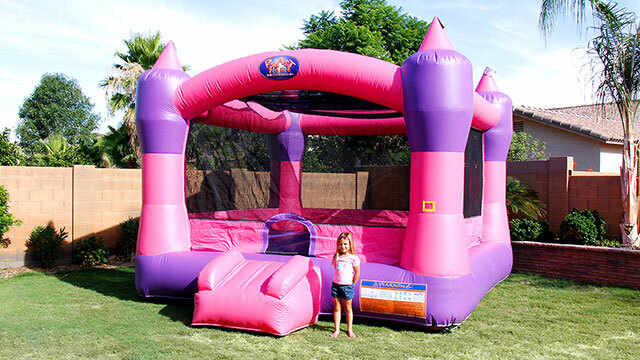 During the hot summer months the Princess Castle Bouncer can we rented with a misting roof to lower temperature inside by up to 30 degrees. If you have little ones they shouldn’t have to miss out on the fun. Our Toddler Bouncer is just a mini version perfect for those new to jumping around. The mesh doors allow easy entry and exit and snap shut for safety. A slide at the front makes exiting fun. Nobody gets excluded with this one! 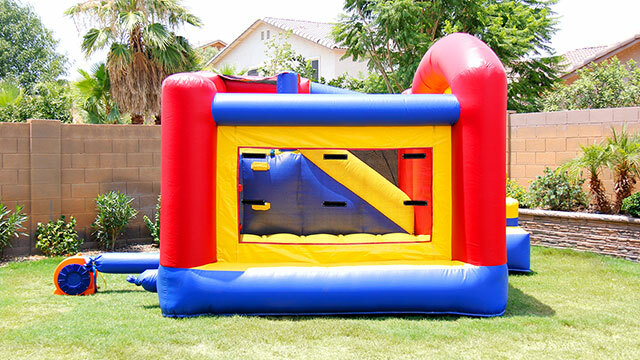 The Toddler Bouncer makes a great party addition for young kids that can’t safely jump with the big kids, but can only be rented in conjunction with one of our full-sized inflatables. 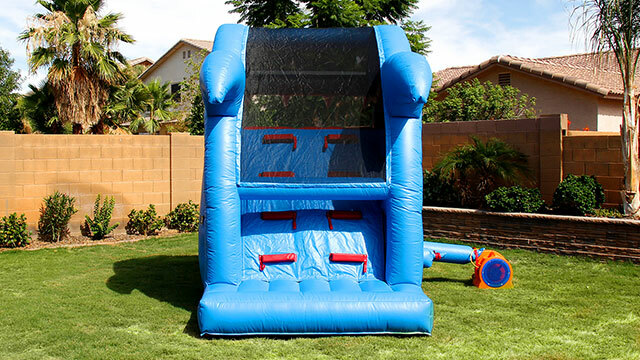 Our Ultra Bouncer Combo is an attractive combo, providing kids with a big bouncing surface, a climbing wall, and a slide for hours of fun! A small ramp provides safe, easy access to the bouncing area, and the surrounding netting and snap-shut door will keep kids safe while they bounce and have a blast! It also includes a mesh roof to help players escape the Arizona sun and keep cool for hours of jumping fun! 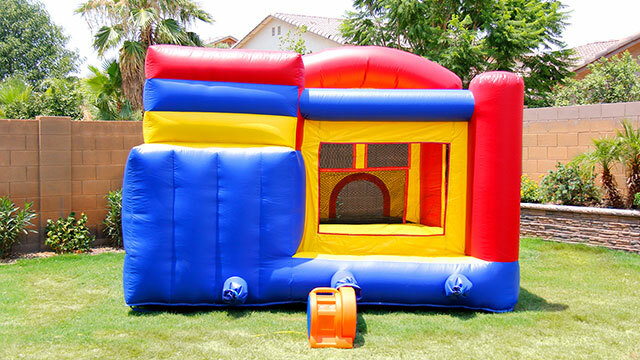 This inflatable is great for both private rentals and commercial rentals for recreation centers, churches, or schools. The slide is coated with a special slippery spray to ensure smooth sliding. 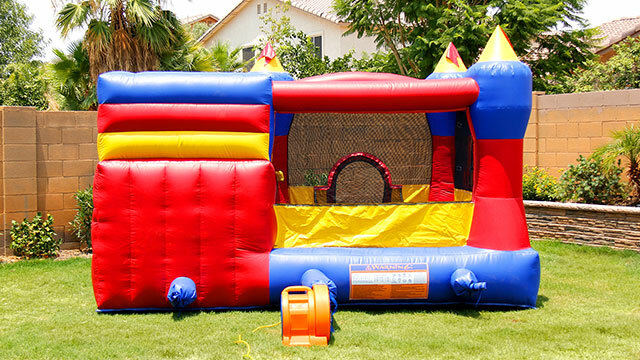 Our Misty Kingdom Combo is one of the coolest inflatables around! 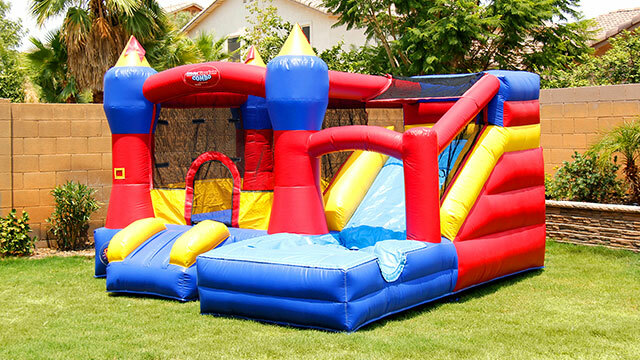 It's a bounce house, slide, water splash park, and ball pit all in one. 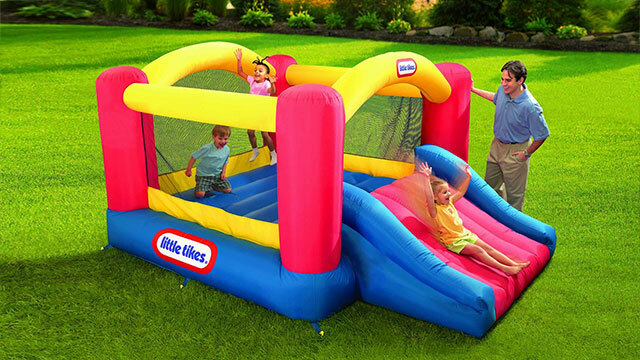 This inflatable play palace can be used wet or dry, and offers everything that your kids are sure to love. When rented dry the slide is coated with a special slippery spray to ensure smooth sliding. Add a ball pit at the bottom for extra fun, especially great for the little ones. 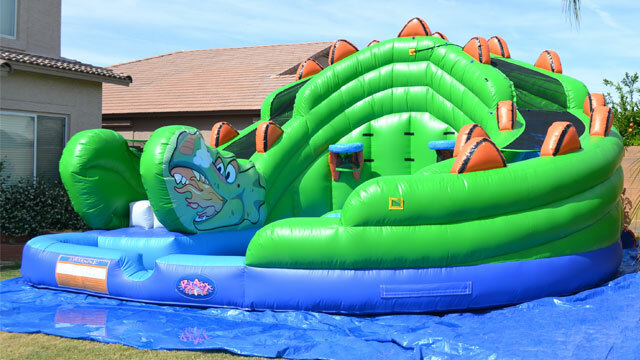 Rented with a water slide the Misty Kingdom is at its best and is sure to make a splash at your event! Our Rainforest Rapids Combo is an ultimate combo jumper! 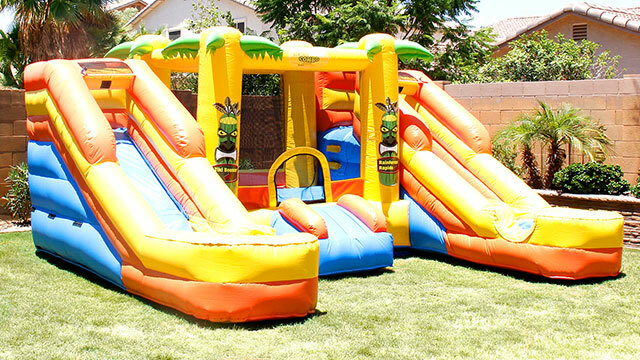 The centerpiece of this party jungle is the Zulu bouncer, a spacious jumping paradise. 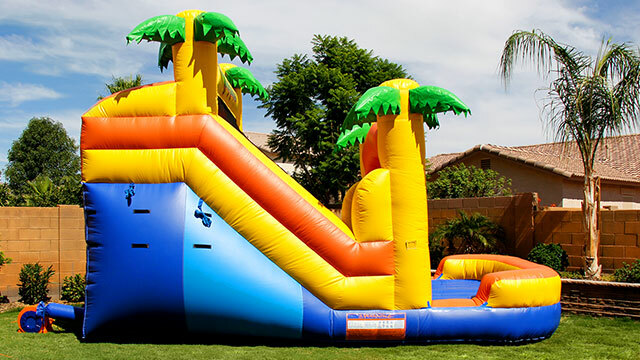 Your kids can climb the cliffs of Zulu to enter either of the slides high above within the palm trees. As water from sprayers rain down from above both of the dual slides, riders can escape down into the refreshing lagoons. When rented dry the slides are coated with a special slippery spray to ensure smooth sliding. 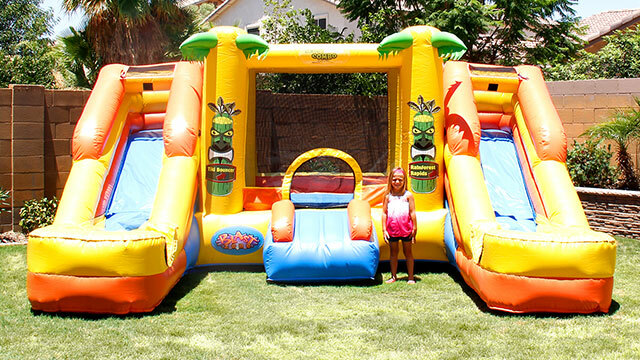 Add a ball pit at the bottom for extra fun, especially great for the little ones. 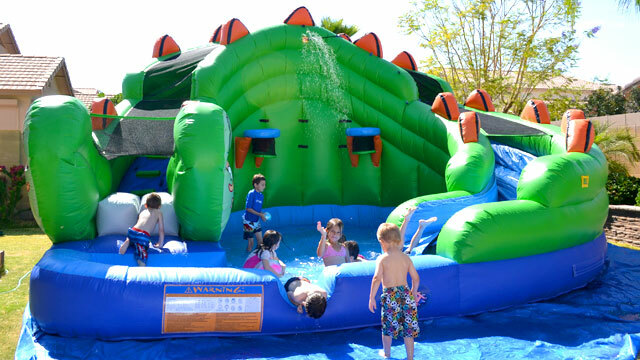 Rented with water slides the Rainforest Rapids is at its best and is sure to make a splash at your event! Our Misty Kingdom Combo XL is a super-sized version of our popular Misty Kingdom! 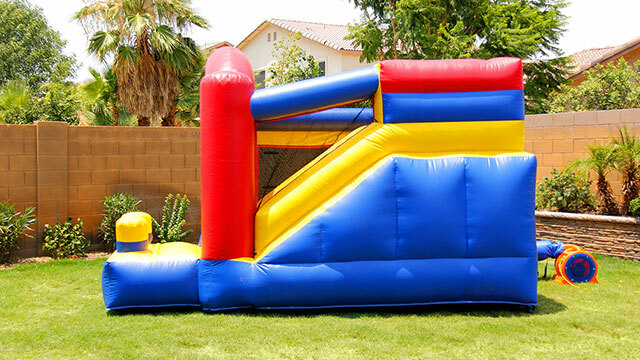 Bigger bounce area, taller slide, same great fun. 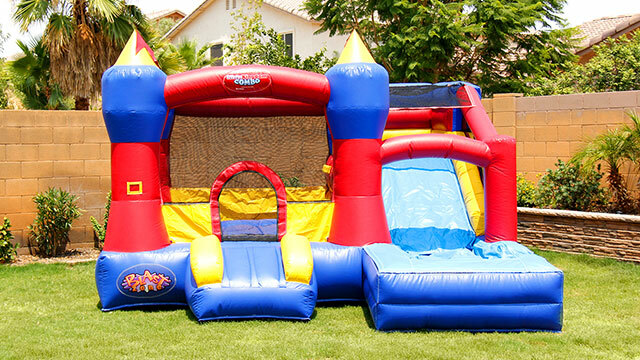 This inflatable play palace can be used wet or dry, and offers everything that your kids, big or small, are sure to love. 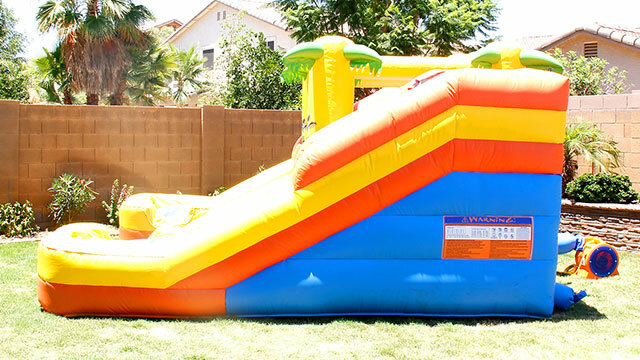 When rented dry the slide is coated with a special slippery spray to ensure smooth sliding. 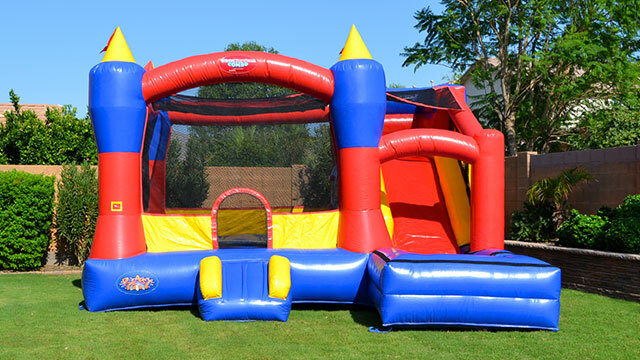 Add a ball pit at the bottom for extra fun, especially great for the little ones. 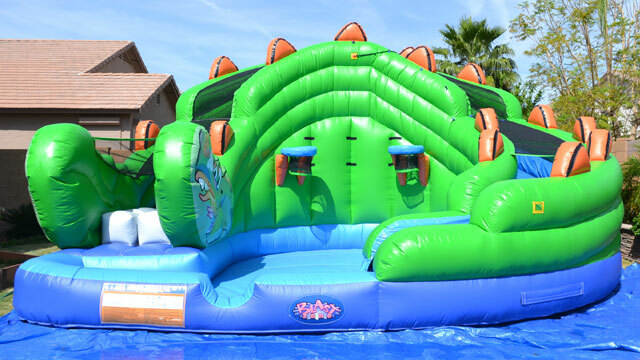 Rented with a water slide the Misty Kingdom XL is at its best and is sure to make a big splash at your event! Our Dragon Blast Combo is a behemoth! 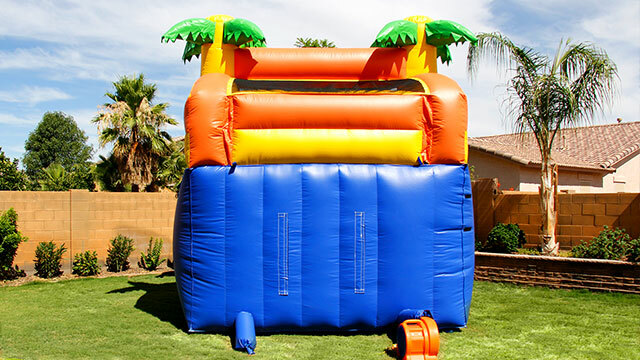 A giant splash pool is surrounded by a mini obstacle course and curving slide. There's 2 basketball hoops and water sprays down from above. 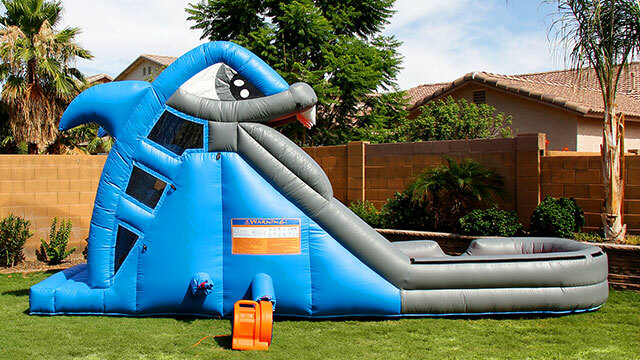 This beast turns your backyard into your own little water park oasis. We only rent this with water for summertime fun. Comes with mini basketballs and an assortment of water toys to keep the kiddos entertained all day. 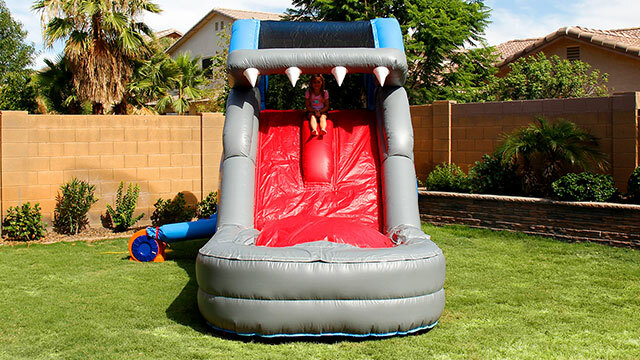 Our Great White Wild Slide can be used wet or dry, all year round! 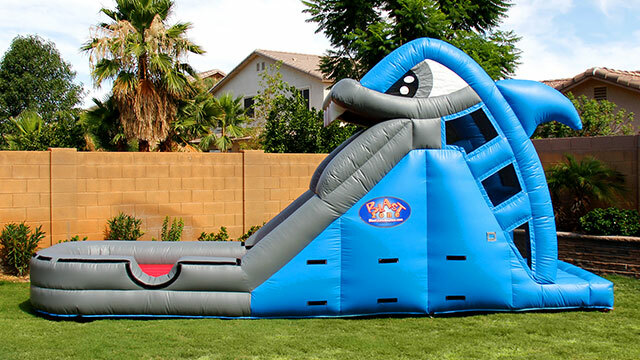 Kids climb up the back of the safety mesh enclosed shark's head and slide down the tongue. 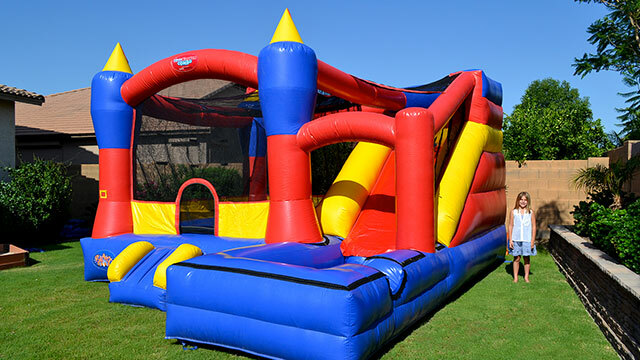 The slide divider makes it safe and fun for two sliders to race down at the same time. 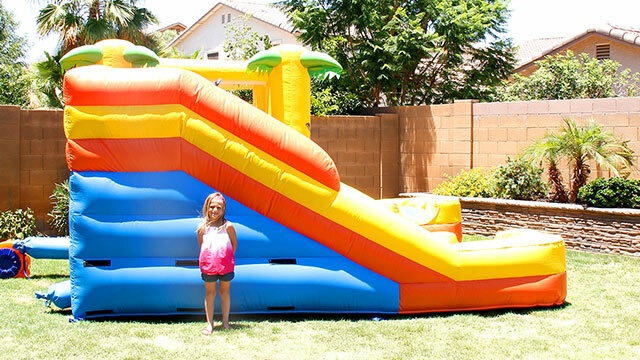 This slide is great for parties or everyday use and is over 20 feet long! When rented dry the slides are coated with a special slippery spray to ensure smooth sliding. We also provide 2 sliding sacks for another way to play. 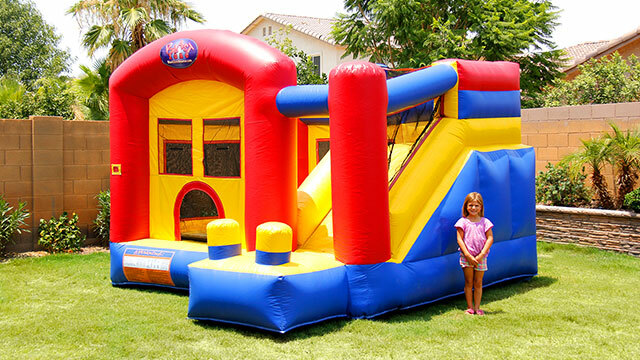 Add a ball pit at the bottom for extra fun, especially great for the little ones. 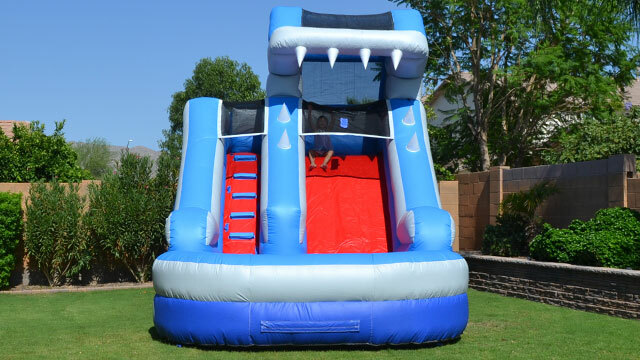 Rented as a water slide the Great White Wild Slide is at its best and is sure to make a splash at your event! 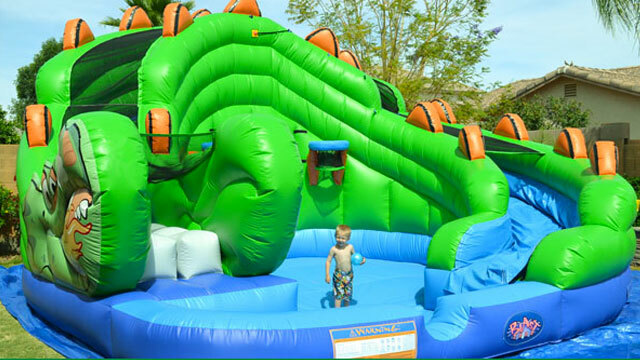 Our Roaring Rainforest Slide can be used wet or dry, all year round! 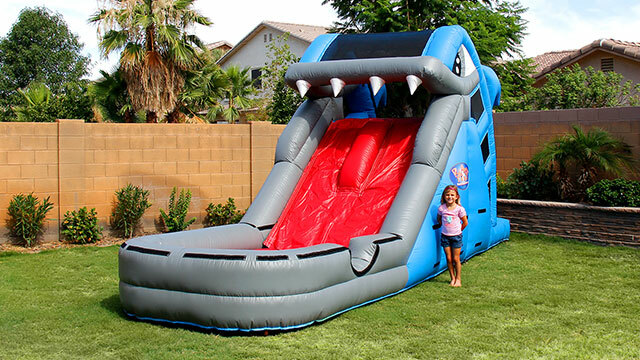 This monster party slide is guaranteed to make a serious impression at your event. 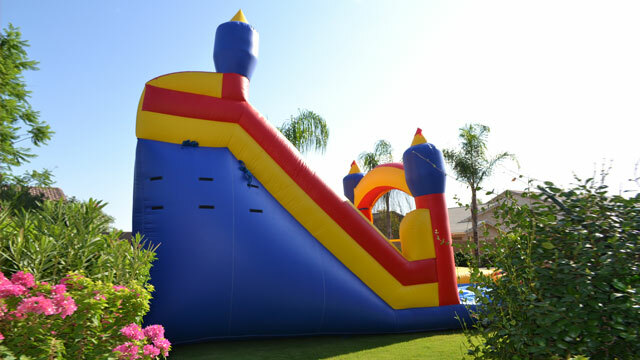 This slide is great for parties or everyday use. It features an enclosed climbing lane and top making it easier for riders to climb up safely. Once at the top of the slide, the riders are in for a thrill! 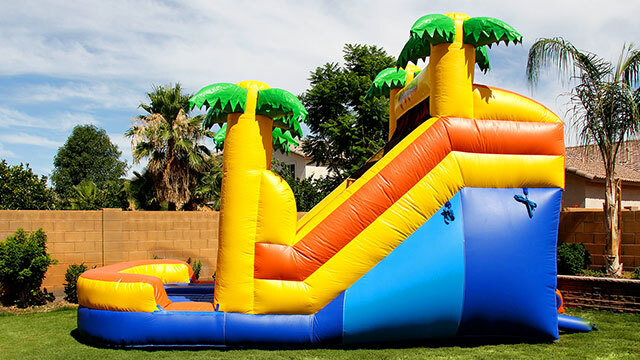 When rented dry the slide is coated with a special slippery spray to ensure smooth sliding. We also provide 3 sliding sacks for another way to play. 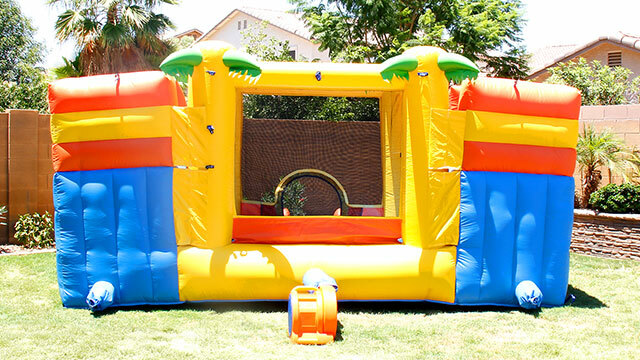 Add a ball pit at the bottom for extra fun, especially great for the little ones. 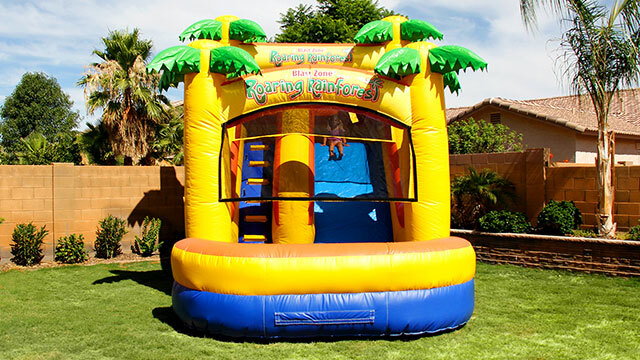 Rented as a water slide the Roaring Rainforest Slide is at its best and is sure to make a splash at your event! 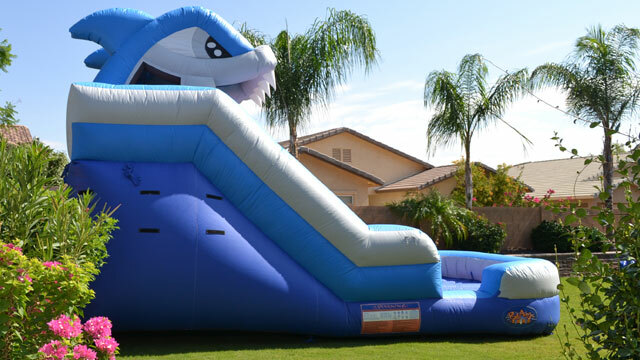 Our Great White XL Slide can be used wet or dry, all year round! 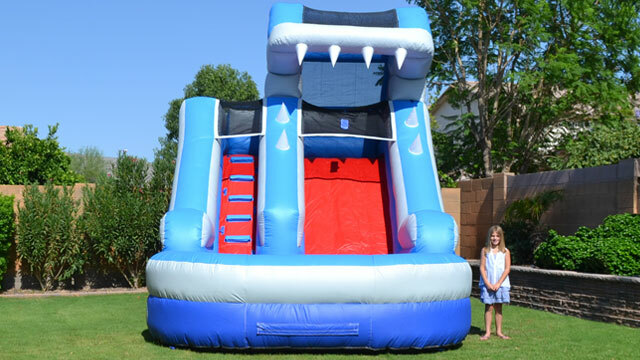 This monster party slide is guaranteed to make a serious impression at your event. 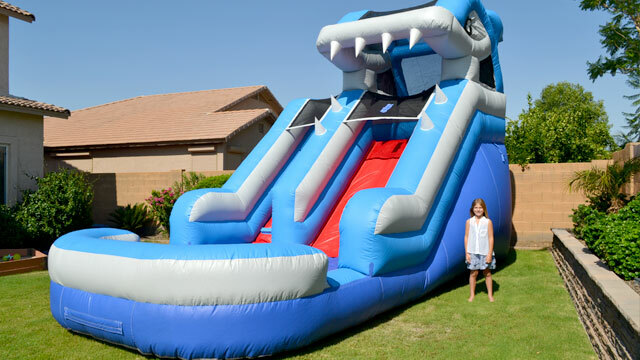 This slide is great for parties or everyday use. It features an enclosed climbing lane and top making it easier for riders to climb up safely. Once at the top of the slide, the riders are in for a thrill! 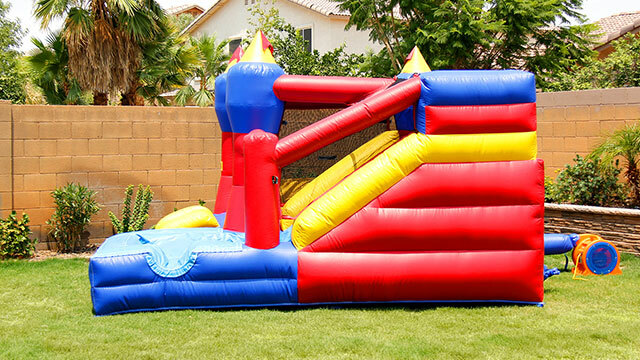 When rented dry the slide is coated with a special slippery spray to ensure smooth sliding. We also provide 3 sliding sacks for another way to play. 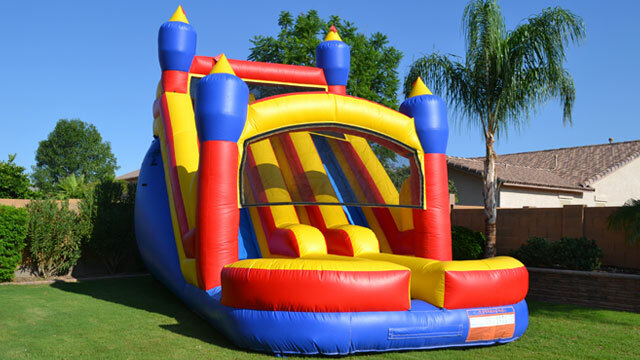 Add a ball pit at the bottom for extra fun, especially great for the little ones. 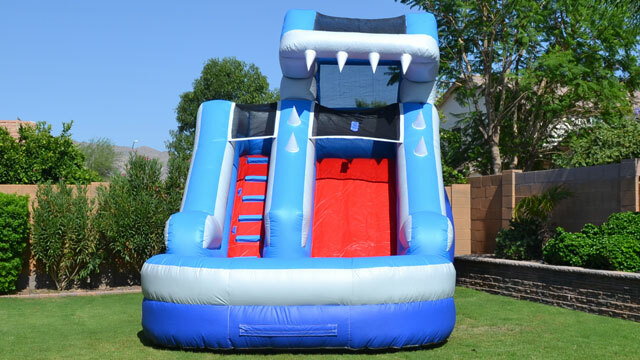 Rented as a water slide the Great White XL Slide is at its best and is sure to make a splash at your event! Our Mystic Mountain Slide is enormous! 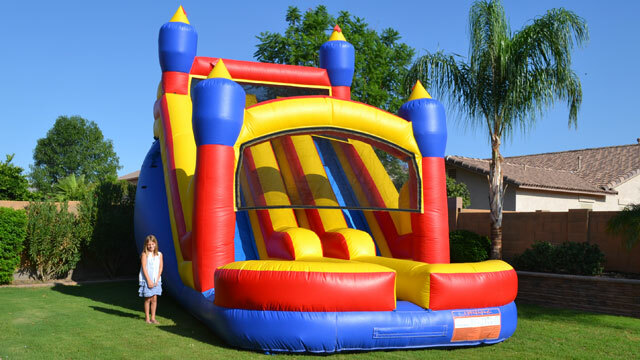 At 19 feet tall it will tower over your party. Not even the most cynical teenager will be able to think this one is "kid stuff". This super steep slide will send riders rocketing down. Two individual slides allow safe racing. 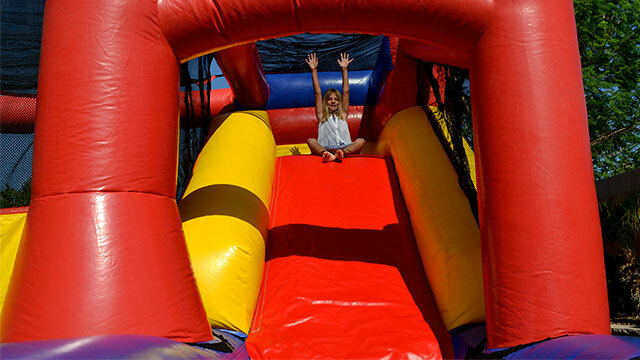 When rented dry the slide is coated with a special slippery spray to ensure smooth sliding and slide sacks are provided. Add ball pits at the bottom for extra fun. 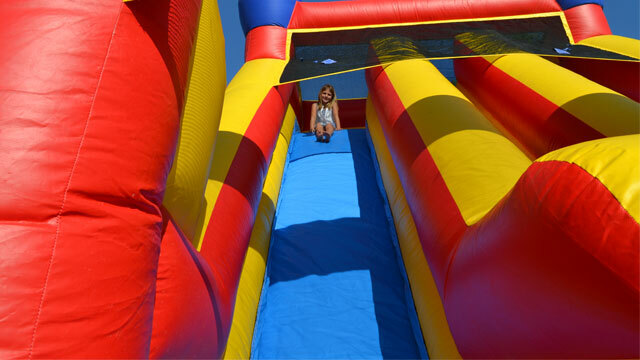 Rented as a water slide the Mystic Mountain is at its best and is sure to make your party a wet and wild time!